The most surprising discovery for me in New York City was how kind the people were. We had heard tales and read stories about how downright rude New Yorkers were, so we went fully braced to meet the rudest people you could ever imagine. While I saw my fair share of impatience among the drivers of the city (come on, if you are twenty cars back, you won’t move forward the instant a light turns green. No need to lay on the horn), the people at most indifferent, and frequently kind. We never got weird looks for having kids, much less four of them. I can’t say this for every place we have visited. 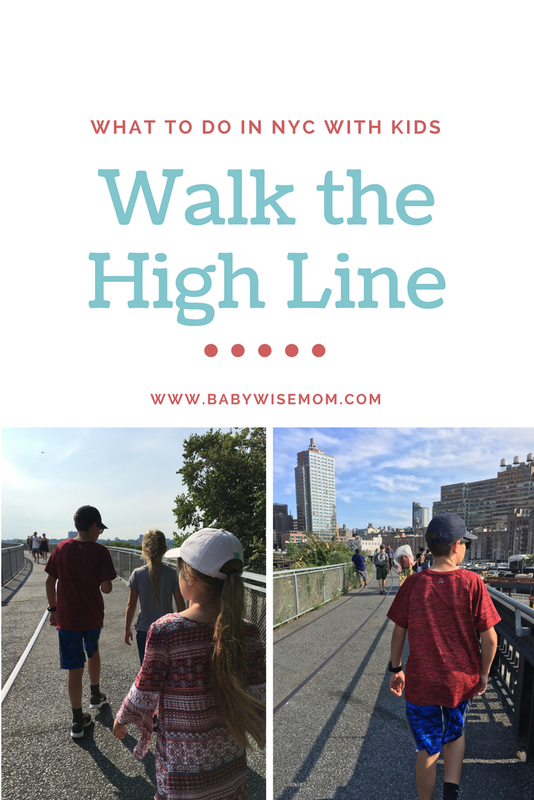 We never got lectured or even passive-aggressively berated for stopping on a sidewalk or in the middle of a busy subway station (though we had fully discussed with our children our sidewalk rules: two by two and never stop). We did get a lot of compliments on our children, though. We rode the subway all over for a week, and there are only two times we got onto a crowded subway and didn’t have people give up seats for our family. Both of those times, it would have been literally impossible to do so (the train was so crowded we couldn’t have gotten to a seat–there was no musical chairs possible). 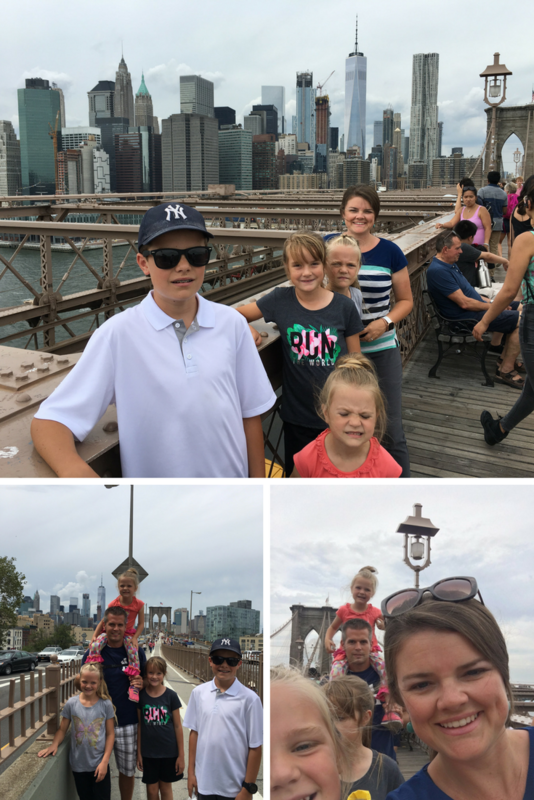 We had kind people visit with us on buses and subways to offer us advice and their “must-sees” and eateries around the city. We had people approach us as we exited a subway station and ask us if they could help direct us on which way to go (most exit to different corners of the block). 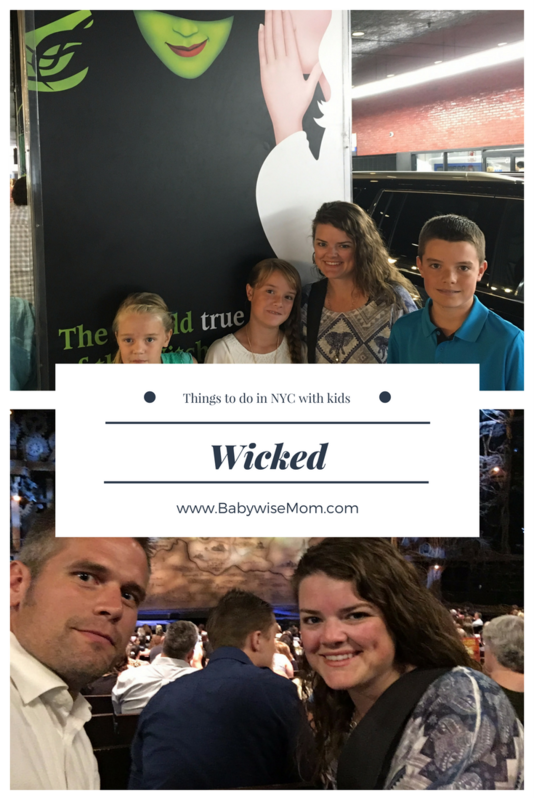 New York was a great place to go with children. There were people everywhere. Everything is fast. The people move fast, the vehicles move fast. When we laded at JFK and waited outside the airport for our Uber to come, I clucked my tongue at how quickly the shuttle drivers were flying by. Humans adapt quickly, though. When we got home, I rolled my eyes at how slowly the shuttle drivers were driving here at the airport. Ha! We also felt strangely alone as we landed in the middle of the night and the parking lot was empty. It was so odd to not be completely surrounded by people. There is a lot of walking required around NYC, and strollers are usually just inconvenient. So I highly recommend waiting until you can go stroller-free to get the most enjoyment out of your trip. We packed a lot in our eight days in New York City. Here is our itinerary along with any comments or tips I have on certain places. 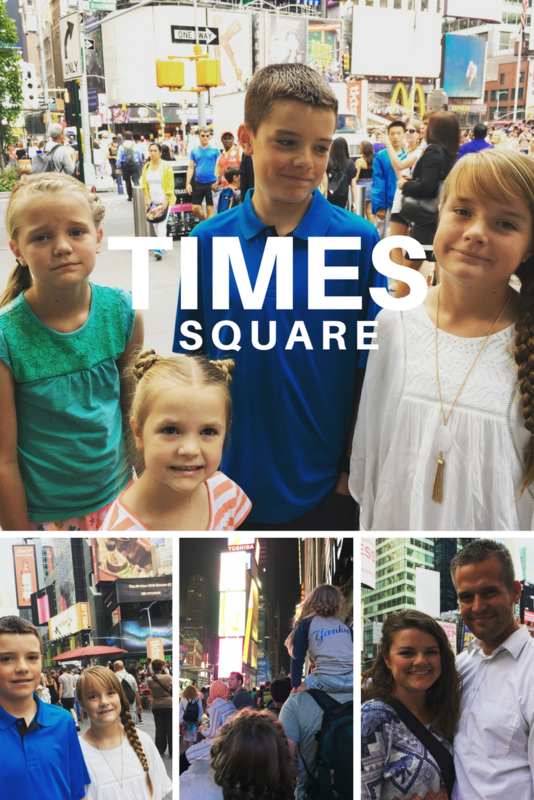 Times Square can be a fast visit with children. When we got there, Brayden asked, “Why is this place famous?? ?” We found ourselves in Times Square almost every day, so you probably don’t need to play a special visit there. Be aware it is always very crowded, especially on weekends. If you have kids who wander or you can’t be sure can stick with the family, you might want to skip this one or stay on the outskirts. This was one of Brayden and Nate’s very favorite things we did the whole time. 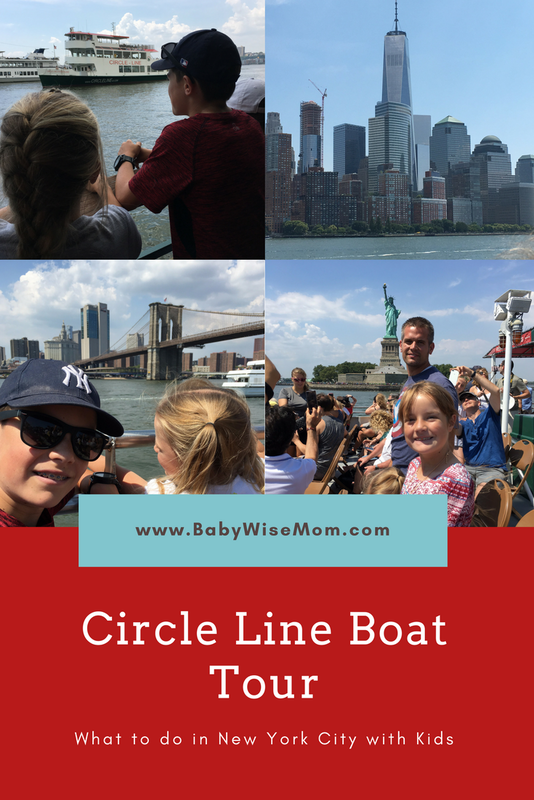 One of my favorite things we did was a Circle Line Boat Tour. 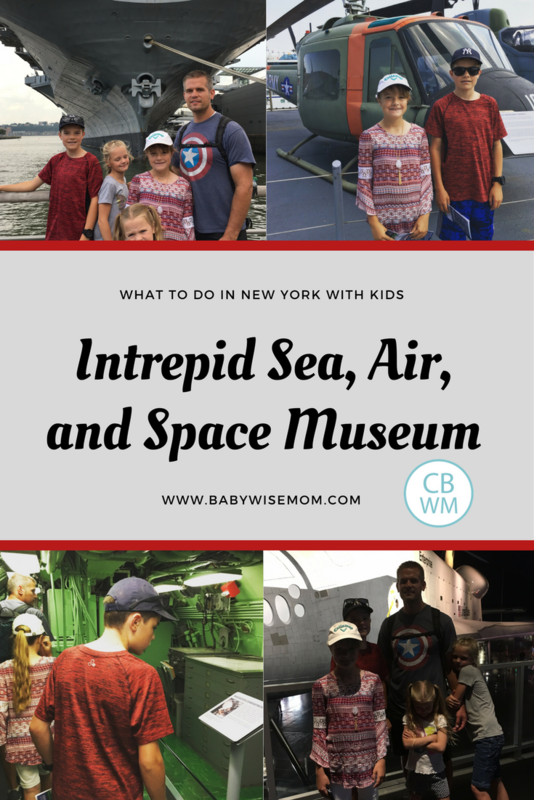 With our ticket, we got free tickets to Intrepid, so if you decide to go on a boat tour, check out their upgrades. 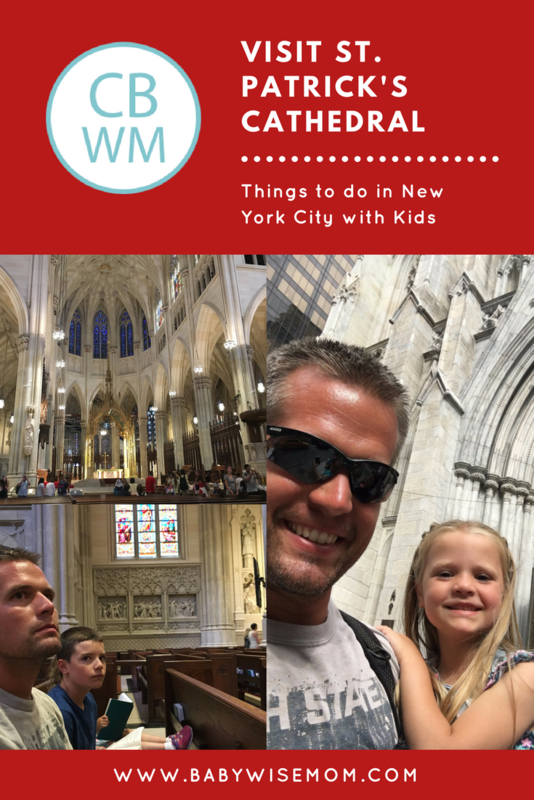 We did the tour that circles the entire island of Manhattan. We did this on our second day, and it was a great way to start off the visit. It helped us have some bearing as we traveled the rest of the city. We were also able to be introduced to some potential places worth visiting that we hadn’t heard of before. The High Line is very close to Circle Line Boat Tour. Now…this was cool considering where it was. It was a neat thing in the middle of the city. However, I live in a place with much more impressive walking paths, so this is a nice thing to do with kids, but didn’t live up to the hype for us. This was a walk we loved. We loved it so much that we did it a second time. We went from Manhattan to Brooklyn one day and from Brooklyn to Manhattan another day. I like the Brooklyn to Manhattan best. On the bridge, they had fruit vendors and also artists selling drawings and photographs. We bought all of these things. Each burough of New York is different from the next. 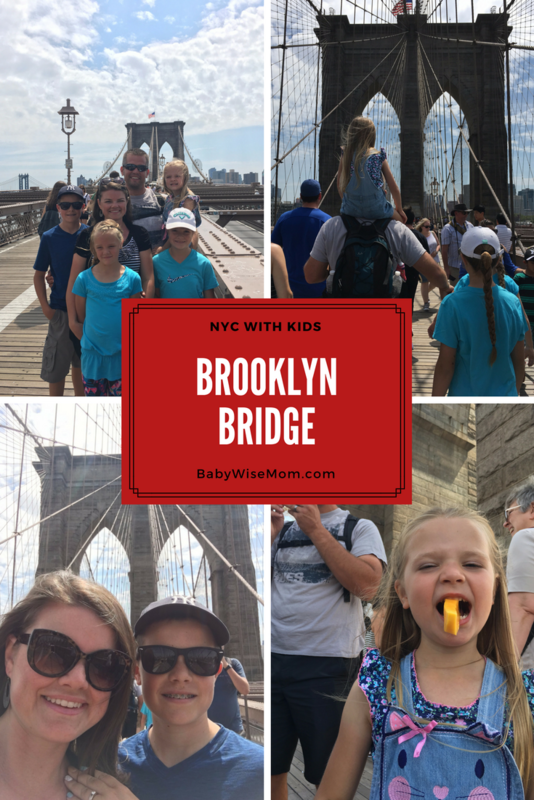 There is a park at the end of the Brooklyn Bridge. 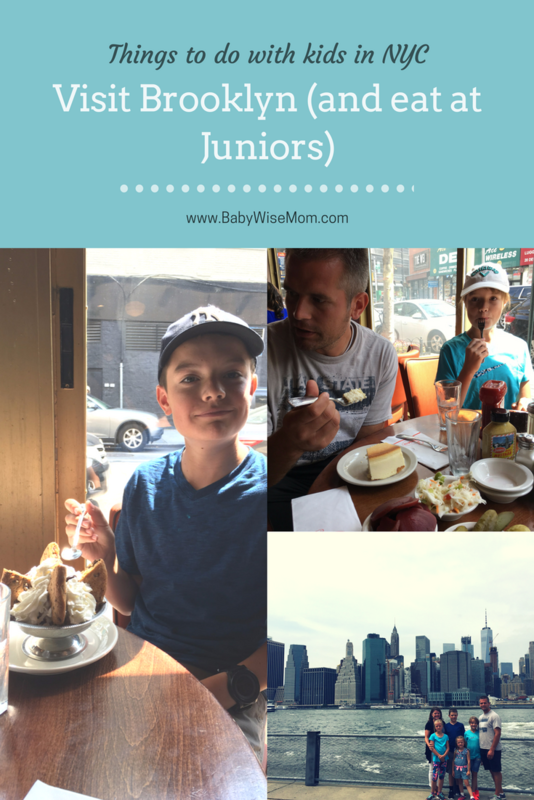 We had also been told about the restaurant Juniors by a Brooklyn native the day before. Amazing! Best cheesecake ever. We went back a second day so we could enjoy it again. There is one of these on Times Square, so you don’t have to go to Brooklyn for it. There are a lot of sports teams in New York City. 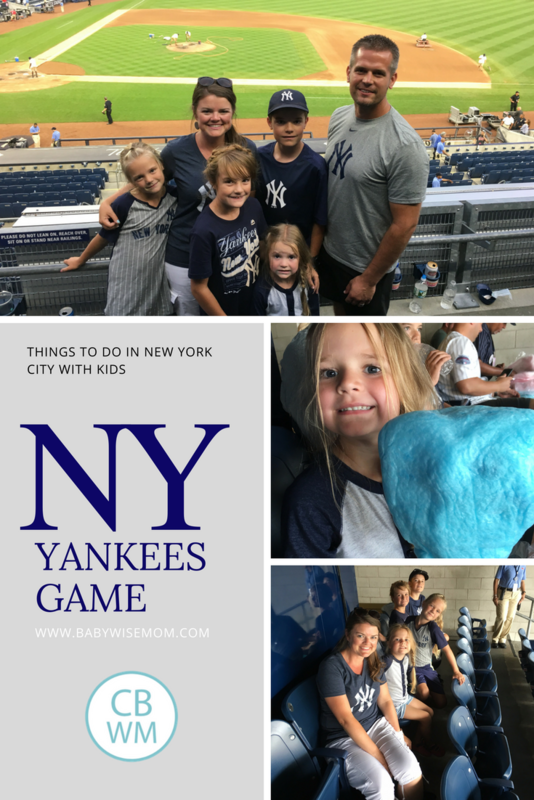 We went to a Yankees game while we were there. The cathedral was a neat place to visit. We played at Central Park two different days. We toured as much of it as possible. We would spend an hour at one playground, then walk to the next one, and so forth. We would stop at attractions along the way. Even with our two days, there was so much we didn’t see. 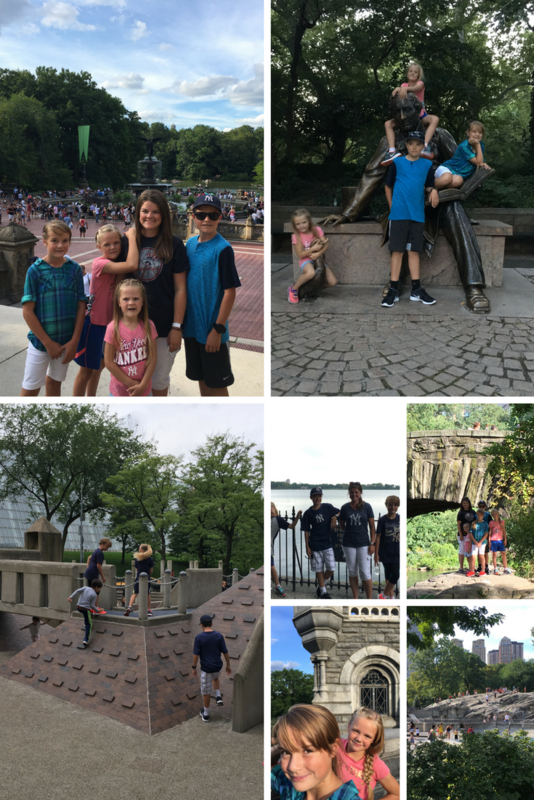 The kids loved being in Central Park. It was a relief from the noises and smells of the city. Plus they had fun playing an being kids. Bethesda Fountain (this is a MUST. It is beautiful and there is so much going on here). 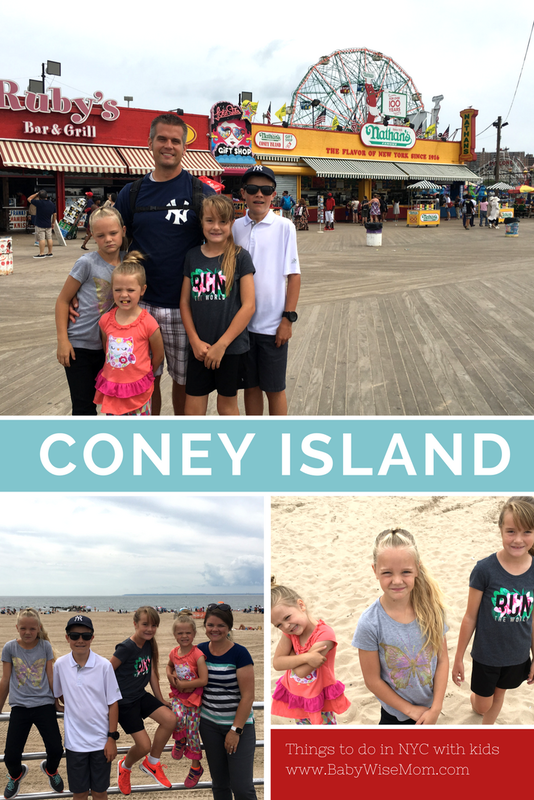 We ended up with an extra day to fill, and decided to go check out Coney Island. We ate Nathan’s hot dogs and let the kids play on the sand for a bit. Coney Island is in Brooklyn. 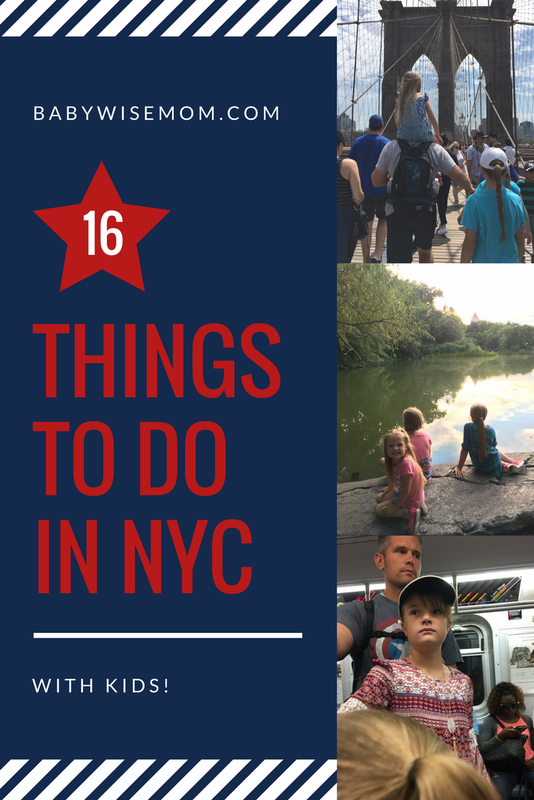 It was about an hour subway ride for us from Manhattan, but a lot of it is above ground through Brookly, so you get to see a lot of that borough. 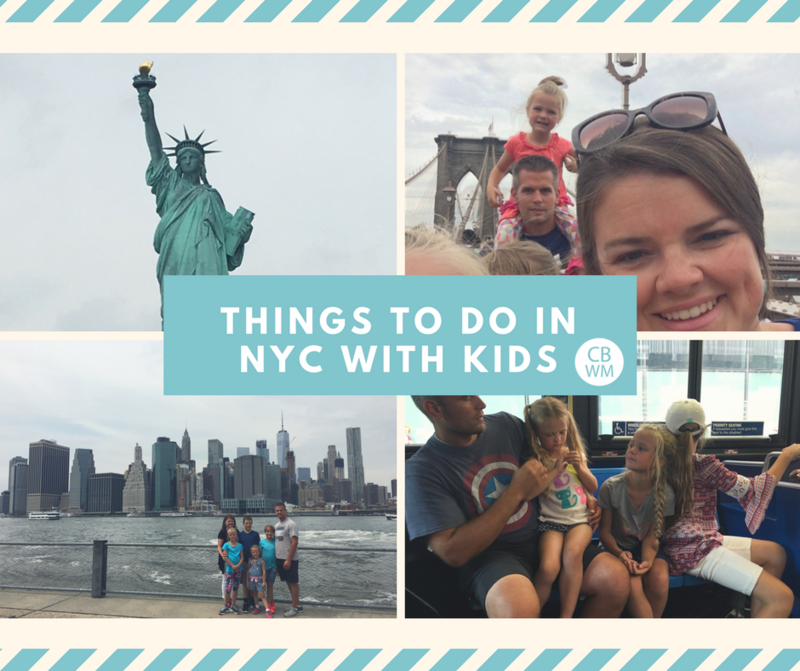 I didn’t think we needed to do this since we had ridden a boat tour and would be riding a ferry to get to Liberty Island. With our extra time, we decided to ride the ferry. It was so great! I enjoyed it a whole lot. It was a different experience than the other boat/ferry rides we had. 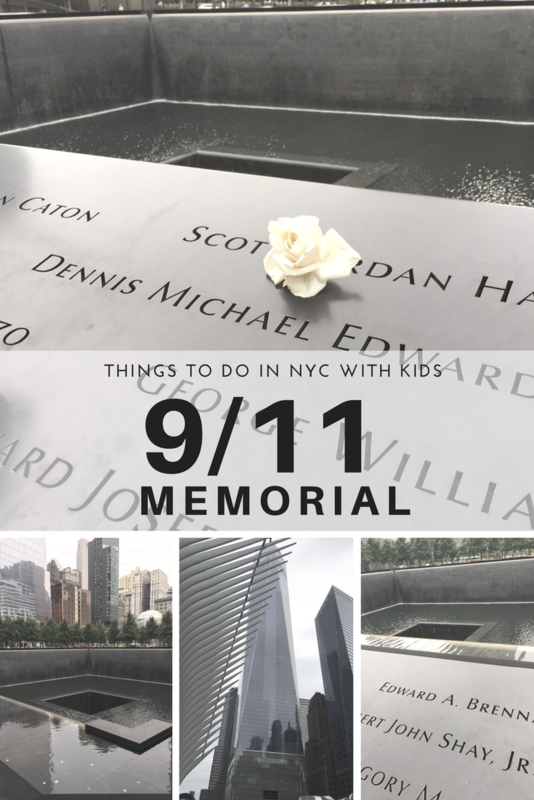 A visit to the 9/11 Memorial is a must. We chose to not do the museum since we had little kids. They wouldn’t have appreciated it and I wasn’t sure by this point in our trip they would still have self control to be quiet like they needed to. 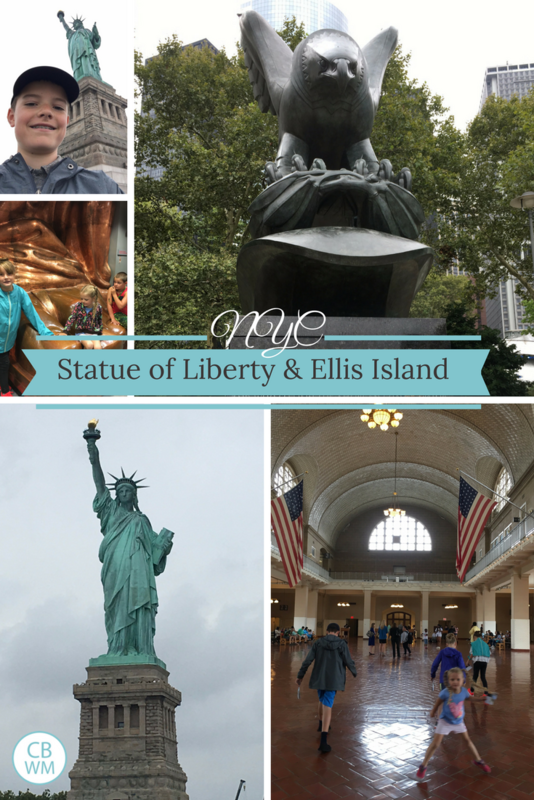 You must visit the Statue of Liberty and Ellis Island! Make sure you get tickets months in advance. There are height requirements for the crown, and you can only get 4 per family, but the pedestal is worth it. Right now, only the pedastal and crown tickets will get you into the museum at the Statue of Liberty. The crown tickets sell out months in advance, so don’t delay. Pedestal you can get closer to your visit. If you purchase online beforehand, you get to skip a lot of long lines at security. So worth it! These things need to be all in one day with nothing else planned for the day. 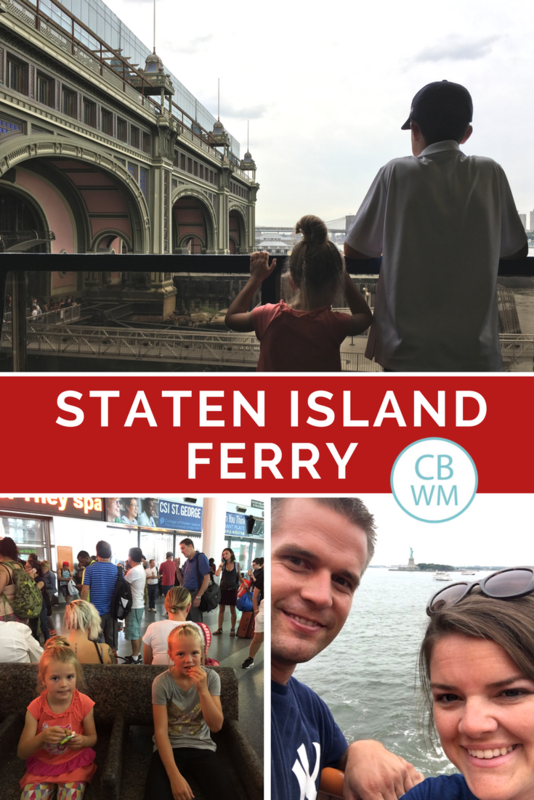 Get your tickets for as early as you can so you have plenty of time to enjoy each island and also enjoy the World War II Memorials at Battery Park. We had a hard time choosing which building to go to the top of in New York City. 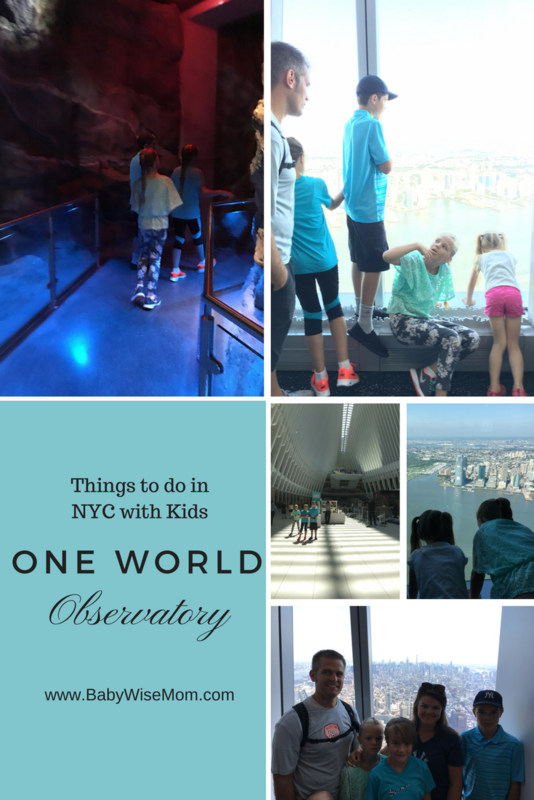 Your three options are The Empire State Building, The Rockefeller Center, and One World Observatory. Everything you read says to avoid the Empire State Building, but this building is so iconic it couldn’t just be crossed off our list without consideration. In the end, we went with One World Conservatory. It is hard to pass up the current tallest building in the Western Hemisphere. We visited the other two buildings, but didn’t go to the top. One World was a great visit. We did it on our last day, and we were really happy we did. It was a fun way to look at all of the places we had been on our trip. When you get in the elevator to go up, pay attention! The ride up is impressive in and of itself. There are so many things you can just see in New York City. You probably won’t have time to fully visit and go inside every place you would like to in New York. We went by and saw several locations. 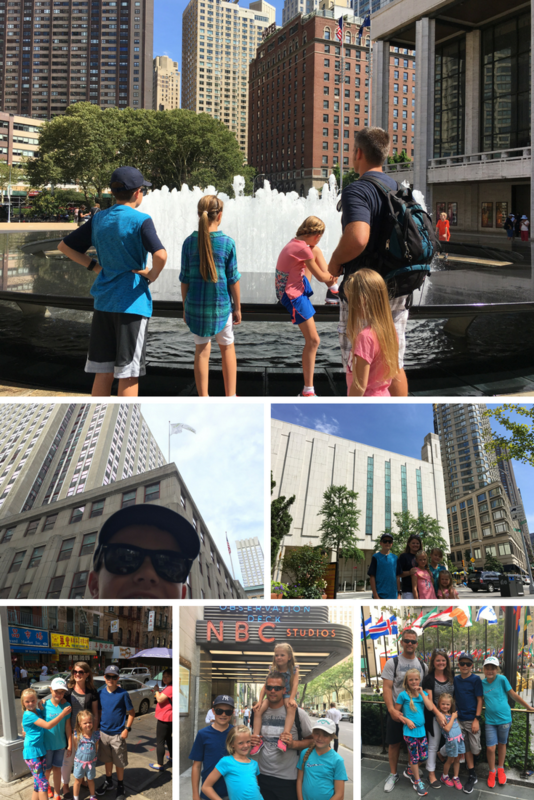 We went by Lincoln Square, Radio City Music Hall, the Rock, the Empire State Building, the LDS Temple, and Chinatown, to name a few. New York City is not the place to rent a car. Plan on either doing taxis, ubers (or something similar), or the bus/subway system. Oh, and of course walking a lot. We primarily did the subway and bus system with a healthy amount of walking (literally, it was healthy). Again, Google Maps comes through big time on helping you with the public transportation. They have a variety of options for how to pay to ride. We went with the seven day unlimited pass. So we were able to ride any bus and any subway for one flat rate. We were always comfortable riding on these. Our children quickly got the hang of entering and exiting as well as standing while riding if needed. We did have some rules that I think helped it be smooth for us. One is that I entered every subway first, followed by the kids, and lastly, Nate entered. That way, if not everyone made it on, we wouldn’t have kids left alone. We never had issue, though. We also had a plan that if we did get separated, the people on the subway would simply exit at the next stop and wait for the people left behind to come along. Then we would all get back on a train together. Again, we never had an issue. We could have if we had tried really hard to fit into overcrowded cars. If it was super crowded, however, we just waited for the next one. This only happened a couple of times all week long. We also had the rule that there was no staring at people around them. If you fly in, I highly recommend the Uber for getting to and from the airport. We took an Uber from the airport into the city, but decided to take the subway back to the airport since we were so familiar with it by then. Ummm…bad decision and one we wouldn’t replicate if given the option. We had to make station transfer, and there were no escalators nor elevators at either station, so we had a lot of baggage carrying to do. Some stations are brutally hot, and both of these were. So we were literally dripping in sweat. Then the line to get to JFK was super crowded. It was also running slow that day. So we waited for 20 minutes for the first train to come, but it was too crowded. Then another 15 for the next, and we were able to get on, but it was standing room only. Super full. Everyone was going to the airport. The ride was over an hour long. So we stood for an hour. With all of our luggage…it was an experience, but just get an Uber. To do the subway, you have to take the air train at the end, which isn’t free even with the public transportation pass. So just go with the Uber. This was such a fun trip! It was so different from our normal lives that it was culturally rich, beyond just the richness of the locations we went to. There are people everywhere. If you have introverts in your family, help them be mentally prepared for this. There were moments–always during rush hour, that Brayden was completely overwhelmed by the sheer number of people. There was a lot of noise and a lot of smells–not always good. Despite that, even the introverts had a good time. By the end, ?Brinley declared she didn’t want to go home, she wanted to live there. I hope you have a great time!